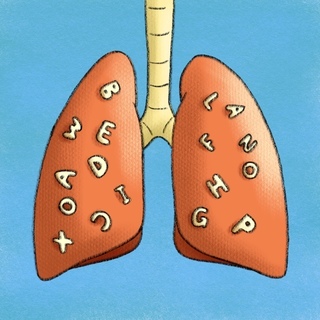 There are over 140 different types of interstitial lung disease, all with their own acronym. This adds up to a complex alphabet soup that can be hard to keep straight in our daily practice. In this segment, pulmonologist and medical educator Dr. Nirav Shah provides us with a broad framework for understanding ILD and how to approach the workup and early supportive treatment. Interstitial lung diseases are a large and diverse group of ailments that can be divided into four main groups: smoking-related, steroid-responsive, connective tissue-related and exposure-related. Diagnosis includes pulmonary function tests and high resolution CT. Treatment is dependent on the type. Do not start steroids until you know what you’re dealing with because it may cause further complications and muddy the diagnostic window. Shortness of breath or dyspnea: may initially be with exertion and then progress to be even at rest. Counseling: STOP SMOKING. Definitive treatment for PLCH is smoking cessation. Pearl: Often these patients have presented with fever, cough and consolidation on imaging. They are treated with antibiotics and their symptoms don’t resolve. They then have a biopsy or further imaging for diagnosis and treatment with steroids. Treatment: if you treat the underlying connective tissue disease you also treat the lung disease; hence, serologies to identify the underlying disease is really important. Decreased forced expiratory volume in one second (FEV1), forced vital capacity (FVC) and decrease in total lung capacity (TLC). Normal or even elevated ratio of FEV1 to FVC.